Cell phone cameras are great! They catch your pet doing silly things. You can catch great feats of daring that your children accomplish. You can also record a mother slapping her child. Child abuse is no joke. 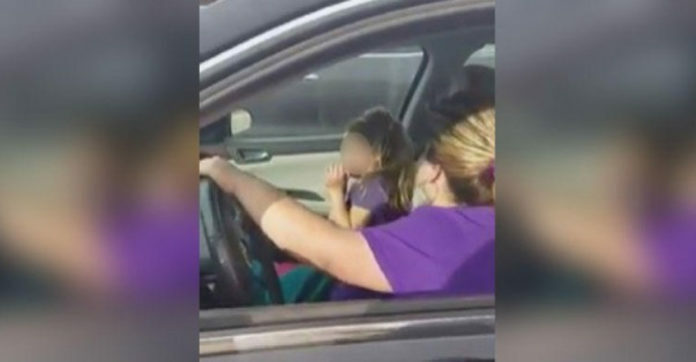 The Texas mother, Angela Armendariz, seen abusing her nine-year-old child has learned that lesson. Armendariz hit her daughter after learning that the girl had spoken to her father. Her father had gone to the school to see her. The girl’s father, Jesus Armendariz, now has custody of his daughter and got a protective order against his wife. The couple is currently in the process of getting a divorce. With this video, it is clear that Angela is an unfit mother and doesn’t deserve to have any contact with her daughter. Not all women are cut out to be mothers. It is so sad the little girl was treated this way by her own mother. Share away, people.